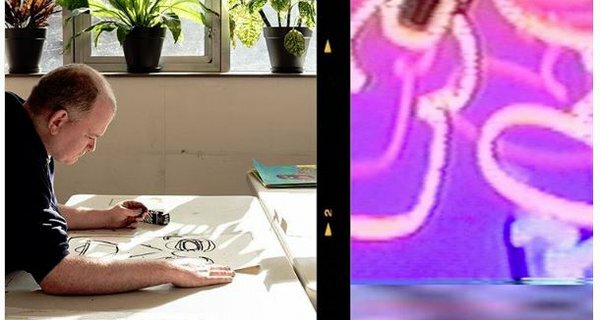 Last year we worked with Arts Council England, Heritage Lottery Fund and the Department for Digital, Culture, Media and Sport (DCMS) to run The Artist+ the Crowd and the Heritage+ the Crowd Matched Crowdfunding Pilot funds. We published Matching the Crowd in October 2017 examining the impacts of matched crowdfunding shortly after these campaigns were completed. That study revealed several immediate benefits of crowdfunding for the projects themselves, including bringing in new donors to the projects, helping them to develop their pitching and fundraising skills and a range of other non-financial benefits such as brokering additional connections and converting donors into volunteers and more ‘active’ supporters. This blog outlines the results of a subsequent survey completed six months after the end of the programme and is concerned with the longer term impacts of crowdfunding. From the original group of 59 projects that participated in the pilot, 39 responded to this survey. It is accompanied by six case studies which look at the specific longer term benefits and challenges of crowdfunding for some of the projects. 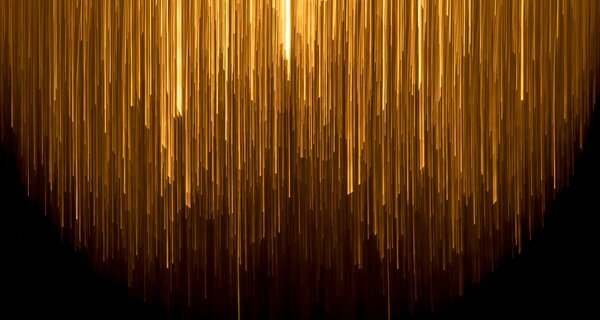 Nesta’s research on Crowdfunding Good Causes outlined that while crowdfunding is self-evidently useful in raising money, it also has benefits in terms of marketing and PR for the fundraising organisation. Through our follow-up survey we found further evidence for this. 82 per cent of our survey respondents agreed or strongly agreed that the campaign had boosted their public profile.This result was reflected in reviews or other forms of professional, peer or media acknowledgement received by projects. This ranged in coverage from individual customer feedback and reviews on social media to more traditional media attention. A number of respondents mentioned their projects had been covered by local press, while many also featured in national newspapers and on radio. For example, 8 MINUTES featured in The Guardian, while eXXpedition received coverage by Sky News. In our previous study we found that participating arts and heritage organisations were able to attract new supporters, rather than only drawing from their existing support networks. Over a third (35%) of donors we surveyed previously had never heard of the organisation they supported prior to the crowdfunding campaign. Our latest survey is consistent with this finding as over three quarters of the respondents either agreed or strongly agreed that through crowdfunding they built new supporters that they will continue to engage with in the longer term. In terms of that engagement, we also asked about the interactions the organisations had with backers since the crowdfunding campaigns. Generally fundraisers reported that they had updated backers on the progress of their projects (92 per cent of projects) and invited them to related events (82 per cent of projects). Other forms of interaction, such as asking for other funding or seeking ideas and feedback, were rarer. Furthermore, gaining the help of volunteers was invaluable to success, with crowdfunding enabling projects to gather a larger group of committed and engaged people to help. Our previous research indicated that undergoing a crowdfunding campaign contributed to skills development for the projects. Some of the skills mentioned in that context were pitching their project, creating films and images for their campaigns, and general fundraising. Our follow-on survey examined whether they had continued to apply these skills months later. 56 per cent claimed they had used their new skills at least 1-2 times since finishing their campaigns. Meanwhile, just under a fifth (18 per cent) of respondents to the latest survey indicated they either had not learnt anything new, or had not used any of the new skills learned through running a campaign. 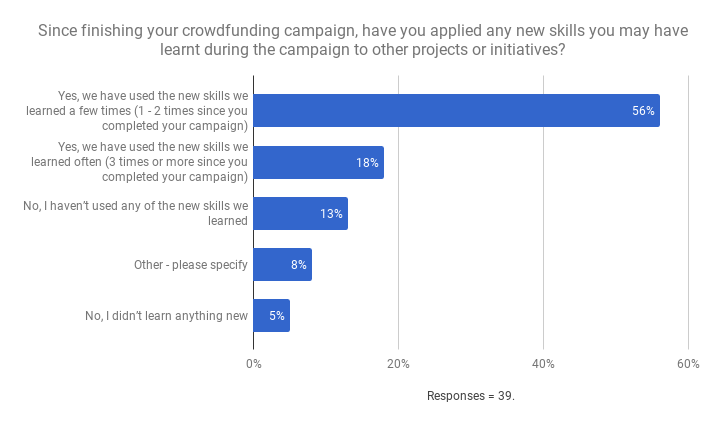 Clearly, this highlights that crowdfunding has had a longer term impact with regards to shaping and honing the skills of those that participated in the pilot. 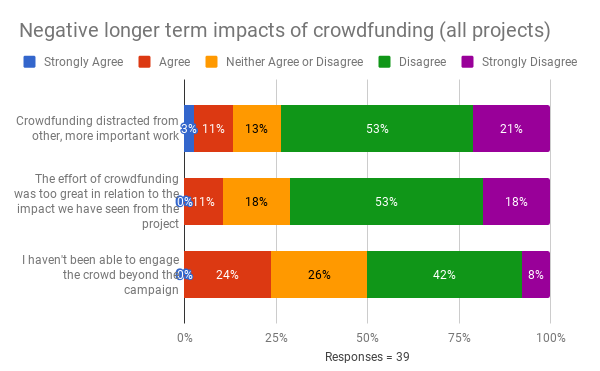 Despite indicating that crowdfunding produces several longer term benefits to participating individuals and organisations, the responses to our survey were clearly not unanimously positive. 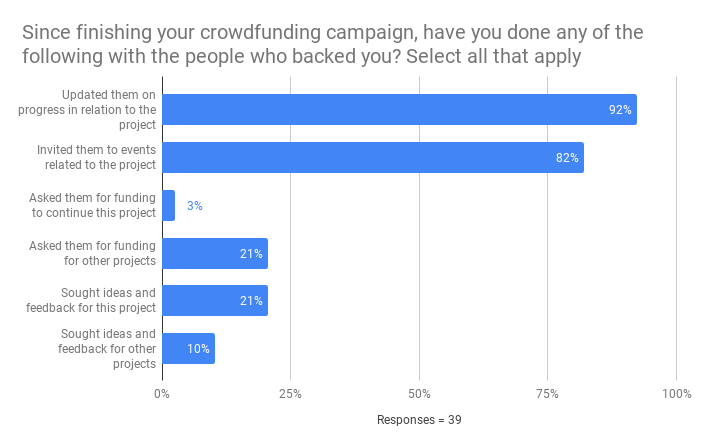 Nearly a third (29 per cent) of those that answered the survey told us the effort placed on crowdfunding was too great relative to the positive impacts experienced. This indicates there are challenges and difficulties associated with running a campaign, although generally speaking the rewards appear to outweigh the costs. The case studies linked to this piece discuss some of those difficulties, which mainly centre around the amount of hard work needed to maintain interest in the campaign once the initial interest has died down. 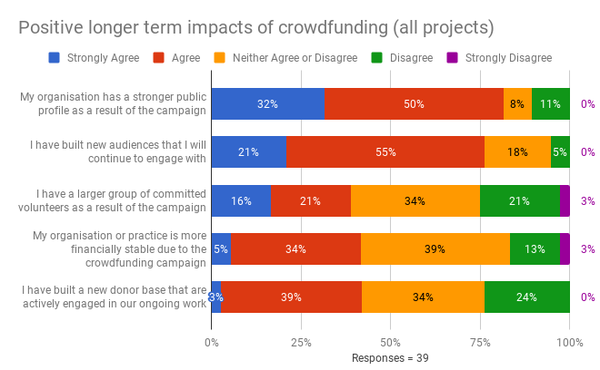 Across the interviews we conducted following on from the survey the main challenge of crowdfunding centred around the hard work required to implement a successful campaign. Ben from the YANK! project recalled “to keep that awareness up throughout the campaign, it was actually a lot more time consuming than we expected”. Similarly, Soraya from the eXXpedition team told us that “after the initial lot of sharing it then becomes quite hard work to keep promoting it and keep making it interesting, so people do still want to look and see.” This is particularly challenging for smaller organisations, who may not have the capacity to keep the public engaged in the campaign by continually changing how they spread their message. Interestingly, one of the interviewees commented on the negative aspects of crowdfunding’s growing popularity. They talked about the large number of campaigns around and the frustrations in particular at larger organisations also using it as an alternative way to raise funds. Our latest survey indicates that the introduction of matched funding would play a significant role in whether those that successfully fundraised for their project through the pilot would do so again. The graph below indicates the rise in likeliness to try crowdfunding again if matched funding is offered, up from just over a third of projects likely without any matched funding, to the majority with a 50% match. This is consistent with our prior research, which found that 33% of projects were influenced to participate by the match. Increasing the match to 75% does not appear to have any added effect in motivating people to crowdfund. 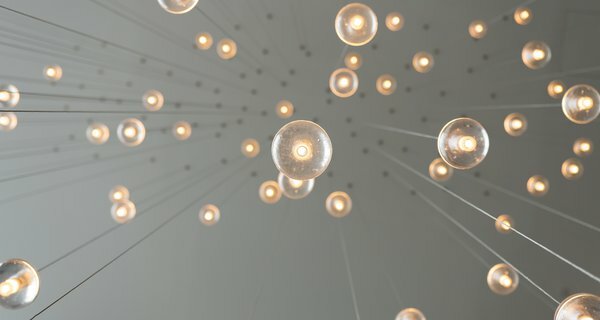 This suggests that if an institutional funder's goal is to increase the number of people trying crowdfunding then, while being substantially more costly, offering a 75% match would not be likely to incentivise more organisations to try than 50%. Our pilot programme has highlighted how the short term benefits associated with crowdfunding translate to longer term impacts for the cohort of arts and heritage projects that received match funding. Beyond the short term injection of cash, the participating projects have reported a series of longer lasting impacts. The successful campaigns have been subsequently used to leverage further funding by many of the projects. Furthermore, the majority of respondents to our 6 month follow-on survey revealed that the campaign led to having a stronger public profile and attracted new audiences partly as a result of that exposure. While their base of supporters had widened, there are questions around how engaged those new backers were after the campaign had ended. 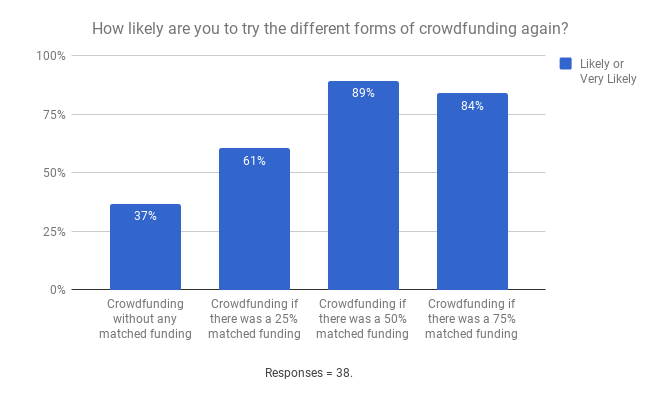 Finally, the majority of respondents indicated that the hard work involved in running a crowdfunding campaign was ultimately worth the rewards and that the matched funding element would significantly increase their likelihood of undertaking further crowdfunding.